Reins are very personal and result in many variations on a theme. Split reins are offered in brown or black beta in widths of 5/8", 3/4" or 1". 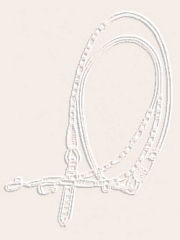 Reins used for a bridle come standard in lengths of 7 1/2 feet. If they are to be used with a snaffle bit, they come in a standard length of 8 feet. Once again personal preference may require a longer or shorter rein on request. Weight on the popper end is important and extra weight may added to help the "feel." Added poppers require an extra charge in beta or leather(see prices below). Prices: All prices in solid brass hardware. $15.00 extra for stainless steel. Closed or split reins with Horse Shoe brand ss hardware. 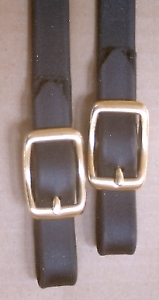 WB/SRsb - $70.00 Solid Brass buckles. WB/SRss - $75.00 stainless steel buckles. WB/SR-SB - $75.00 with Solid Brass conway buckles. WB/SR-SSt - $90.00 with stainless steel conway buckles. WB/SR - $90.00 with stainless steel buckles. WB/SR/SSil - Price quote with silver.